The details I have of Sgt Tearle of the Women Police Service (WPS) are sketchy and incomplete, but I know who she was, and a little of what she achieved in her very short career, which, in the documents I have, is sandwiched between the 1911 census when she was a teacher, and 1919, when she married a farmer. The Women Police Service was initially set up by Nina Boyle and Margaret Damer-Dawson, with Mary Sophia Allen as the second in command. She took over as Commandant following Margaret’s death in 1920 – Nina had already left by about 1915. Various experiments in how the service should be run, and what it should do were tried, but its biggest impetus was in 1916, when the Police, Factories, etc (Miscellaneous Provisions) Act of 1916 brought the WPS members’ pay into line with that of policemen. It was at this stage, too that the Ministry of Munitions asked the British Prime Minister (Lloyd George) to provide women police to supervise the workers in the munitions factories. In order to supply the Allies with the huge explosive shells needed on the European front line, factories were constructed, and women were hired to fill the big brass shells with high explosive chemicals. These factories had grown to huge proportions and some housed as many as 12,000 female workers. One of the jobs of the WPS was to search the workers when they arrived at work, and again as they left. Women police were needed for this, hence the advertisements. The training schools were based in London, Liverpool and Bristol, and more than 1000 women were posted to positions all over Britain. The first batches of women police were sent to Queen’s Ferry, Gretna, Waltham Abbey and Pembrey. I have three glimpses of Katherine in the newspapers of Walsall, Staffordshire. The first is from the Walsall Observer dated 11 May 1918. Katherine has arrived at Walsall with Miss Williams. They have been recruited by the Borough Force after having been trained in London and gained experience in several other towns and have gone to Walsall from a Hereford munitions factory. The Town Council will be asked to “sanction the policewomen’s rate of payment” of 36s per week plus 10s war bonus. The only munitions factory I know of in Herefordshire was called the Royal Ordnance Factory, Rotherwas. It was active in both WW1 and WW2 and employed 12,000 men and women. There was a police force of about 30 in Rotherwas, but the only photo I know of is exclusively men. The WPS, apparently did not count as police – in spite of their name – but no-one else would have been allowed to search women workers. Be that as it may, the next article from The Walsall Observer describes a court case on 8 June 1918 when Constable Tearle and Williams caught young boys playing betting games in the street. They ran off, but Constable Tearle gave chase, caught one of them, and he gave details of the others. Some were placed on probation, and another was fined 10s. On the same day the constables caught a group of men playing cards in a park, and while most of them got away, one surrendered to Constable Tearle, and the court fined him 5s. By 24 August 1918, Katherine had won her sergeant stripes. In the Staffordshire Advertiser of that date, “Sergt Tearle” gave evidence in the trial of a young woman who had struck her because she “lost her temper.” She was fined 10s. We know Katherine was at Gretna. Here she is sending her signature “K.M.TEARLE (SGT. W.P.S. )” in friendship and humour to the patients of 3rd London General Hospital at Wandsworth. This hospital has a remarkable story. The munitions factory at Gretna opened in April 1916. It was vast – 9 miles long and 2 miles wide. Codenamed Moorside it employed 20,000 workers. It is difficult to decipher exactly when Katherine was at Gretna, certainly not 1916; the folder contains lots of miscellaneous pages in no particular order, so her signature is not necessarily of this date. This decision is taken on the evidence of the three Walsall newspaper articles. Sergeant Tearle must have left for Gretna after August 1918, with perhaps just a few months of WW1 remaining. The picture above of Sgt Tearle was from a 1917 Women Police Service newsletter, so this service predates her experience at Walsall and would potentially have helped her get the job. The newspaper clippings quoted above talk about the need for new women police to be experienced and cites her and PC Williams having previous experience at a munitions factory in Hereford. After the war, the service was given official thanks, and asked to disband as quickly as possible, says Nina Boyd. The Commissioner of the Metropolitan Police set up the Metropolitan Women Police Patrols (MWPP) and it recruited some WPS members. In 1920, the Met wrote to the WPS telling them that their uniform resembled that of the MWPP and that anyone wearing the WPS uniform could be fined £10 for “masquerading” as a police officer and that the WPS was “unofficial and unauthorised”. It was the death-dell for the WPS. Women who try to change the world will not be tolerated. I assume unblemished from her role in the WPS, and with many stories to tell, Katherine left the disbanding organisation and went home to Bisham, Berkshire. Who was she, this country girl who adapted so quickly to big city ways, who was able to cope, and even thrive in a life with the police? What was she made of? How did she work? Read the story of John Tearle of Hyderabad elsewhere on this site. Katherine Mary Tearle was his aunt. She was the daughter of Enoch Tearle born 1841, of Stanbridge, Bedfordshire and Elizabeth nee Jones of Flintshire, Wales. Enoch joined the Kings Own Regiment and the couple had children in Aldershott, London and Ireland. When he left the army and settled in Bisham, Berkshire, they had John Herbert 1881, Katherine Mary 1885 and Samuel Hugh 1889. As you can see from the story of John Tearle of Hyderabad, they all had active, interesting lives…. It is possible, but I do not know for certain, that she might have known her grandmother in Stanbridge. She could have taken the rail to London Euston and from there to Dunstable, changing finally for the branch line to Stanbridgeford, and a short walk to see Grandmother Martha. She was only 10 years old when her grandmother died, but I have seen other children of Stanbridge parents taking the train from London to Stanbridge. In the event, her childhood was in the centre of a country idyll and she watched her father as he worked. I thought Katherine Mary had the quiet life, but everything changed soon after the start of WW1 and she showed she had metal, the same metal as her father and any of her military brothers. If the WPS had not been disbanded, Katherine may well have stayed on in the police force, but that did not happen, she returned to Bisham, Berks and met and married Charles Leonard Randall, of Hyde Farm in Bisham. He had applied for, and successfully gained, a conditional exemption from volunteering for WW1 soldier duty, because he was a farmer. If the farmers do not farm, because they are not on the farm, then the entire country could be crushed by famine. The Reading Mercury of 20 January 1917 reported the result of the tribunal’s decision. In 1919, he married Katherine in Maidenhead, Berkshire. A little research into the Randalls showed they had been in Bisham since at least 1827, and most of the men had been blacksmiths; in fact, in the Bisham census of 1841, only a farmer, a bootmaker and the two village blacksmiths had their occupations recorded; all of the other men in the village were recorded as Ag Lab; an agricultural labourer, no matter how skilled their work. By the time Charles was born, the Randalls had been in the village for four generations. I have not been able to find any children for Charles and Katherine, and Charles died in the Windsor hospital on 31 May, 1931, aged just 50 years. Katherine was given probate on his will. This story ends in Surrey, though I do not know exactly where, with the death of Katherine Mary Randall nee Tearle in 1967. She had brought honour, courage and resourcefulness with her from her family, and she showed those who would judge her that she was a woman of substance and determination. It has been a pleasure to find such a rich story, and to be able to recount it. Thank you very much to the West Midlands Police, especially Corinne Brazier Museum@West-Midlands.pnn.police.uk who asked me about Sgt K Tearle, sent me many resources to help me in the search, and set me off on a voyage of discovery into the history of the WPS. It has been fascinating. Thank you also to Barbara Tearle of Oxford who found the newspaper articles and other resources I have been able to work with on this assignment. She has come to my rescue yet again! Thank you also to Richard Tearle, leader of the Yahoo Tearle Group, who is always supportive of the work I do and whose enthusiasm on all things Tearle is infectious and endearing. Woollacott, Angela On her their lives depend: Munitions Workers in the Great War. University of California Press. ISBN: 9780520085022, May 1994. History of Met Women Police Officers: a somewhat truncated and biased version of the events during WW1. I very much doubt that Katherine Mary considered herself an extremist. 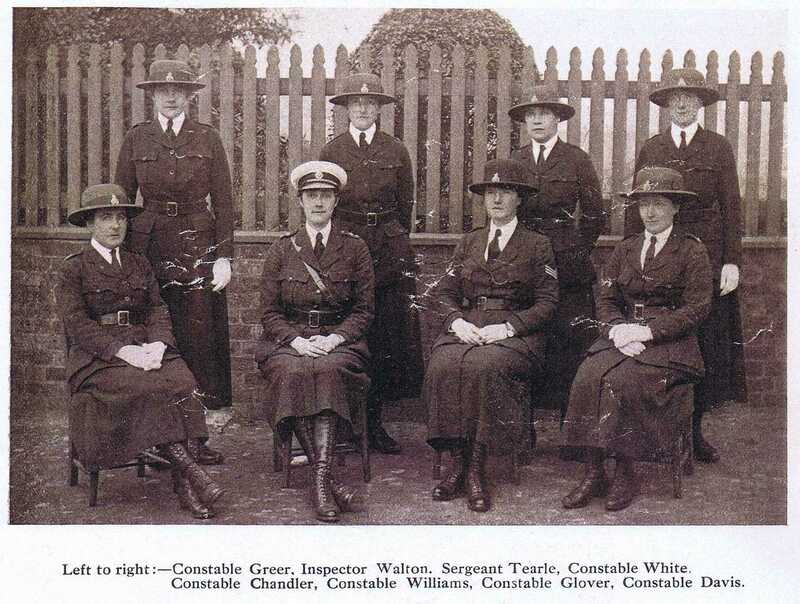 The Women Police: The Open University is dismissive of the WPS (“links to militant feminist causes”) but notes that the Met’s women police, which started in 1919, who were forbidden from being sworn in as constables, and had no claim to pension, were axed in the Geddes post-war austerity measures of 1922 because what they did was “not proper police work.” They couldn’t “do proper police work” if they couldn’t arrest anyone. Once the WPS was out of the way, the Met could – and did – drop any pretense at wanting female police officers.